Many of you will recognise that two of the readings chosen for this Mass were the assigned readings for last Sunday’s liturgy. Jim died within a few hours of those readings being proclaimed in Catholic churches throughout the world, just a few minutes into the first hour of Monday morning. 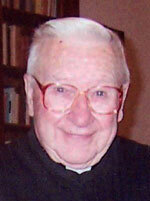 He was a few months shy of attaining 88 years of life; two months shy of celebrating 65 years as an SMA priest. Today we gather as a Christian community to celebrate his life and to pray him home to the God he strove to serve faithfully all his life. Homily here.. .
Those who go looking for happiness for itself rarely find it. and conscientious in ones work â€“ then happiness will find you. All that we put into the lives of others Comes back into our own”. Dietrich Bonhoeffer has been quoted as saying “we must learn to regard people less in the light of what they do or omit to do, and more in the light of what they suffer.” Fr Rickie Devine’s life was blessed with many deeds. We will reflect on some of them in the course of this homily. But we remember also that the final years of his life were marked with the sign of suffering. He bore his suffering nobly and well. For a big powerful man the gradual weakening of his body and mind cannot have been easy to accept. His suffering is now finally over. 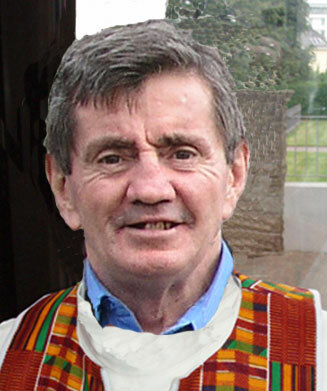 He died peacefully, surrounded by the loving care of his own family and his family in the SMA, on Saturday afternoon last, at Blackrock Road, Cork. … full text here. I imagine, if we were given a choice about when to die, many of us would choose to die during the season of Easter. This is the season of alleluia and new life. The season when we are reminded again and again that death is truly swallowed up in victory. For Oliver Smith it was a lovely blessing to die during this season. And to have died in the very week that the Pope himself died, a man who seniored Oliver by only 20 days, must be regarded as a special privilege indeed. … full text here. 1st February ushers in the Season of Spring. We notice a lengthening of the light at both ends of the day. That theme of light is carried on into the second day of the month, when we celebrate a mini-festival with lighted candles as we contemplate the Presentation of the child Jesus in the temple. 1st February is also the Feastday of St Brigid, secondary patron of Ireland. Tom Higgins’ theology and spirituality would have little truck with modern day, feminist inspired connections being made between a pagan goddess and a Christian saint, but that he should die on this particular day is not without some significance. Brigid consecrated her whole life to God, as a virgin; so did Tom. Brigid is renowned for her hospitality, almsgiving and care of the sick. 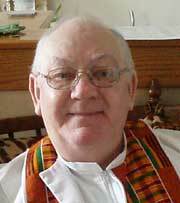 These are themes running through the life of Fr Tom; at one point, as giver; at another, as receiver. 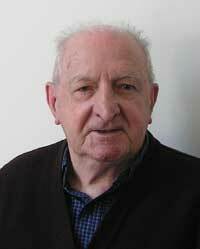 He died peacefully early on Tuesday morning, in Blackrock Road, after a protracted illness. … full text here. The Tsunami tragedy in S.E. Asia over the holiday period has given rise to lively debate as to where was God during this tragedy. How could a good God allow such a tragedy to happen, many asked. This is not a new question. The problem of suffering has been debated since the beginning of time, since humanity has become aware that suffering is part of the human condition. Some valiant attempts at explanation have been offered, running something like the following: God’s is a creation in freedom where the marvellous processes of nature have the capacity to produce wonderful development and growth but can also bring utter destruction and devastation. For God to intervene to stop disasters occurring would necessarily involve the cessation of freedom. In such a state we would all be responding in a programmed fashion like robots. God’s gift was to create the world with its own laws, and human beings with freedom and the ability to make choices. … full text here. There is something very poignant and sad about dying on Christmas Day. And, yet, there is something very uplifting in it also. To die in the hope of eternal life on the very day when we celebrate the coming down to earth as man of the very Son of God, the one in whom all our hopes of eternal life rest, the one who himself incarnated hope, is somehow a beautiful rounding off to a life lived in this unquenchable hope, and dedicated to spreading this same message of hope to the very ends of the earth. 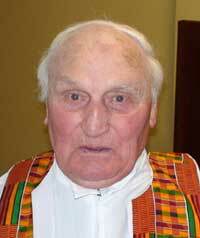 Fr Tommy Lindon passed away very peacefully at about 7pm on Christmas Day. His death concludes one stage of his existence. His death also brings to a closure a time of suffering and unease when the quality of his life was far from what one would wish. For a man of brilliant intellect these last few years must have been shockingly disfigured. And, yet, not least because of the loving care he received in St Theresa’s, he was gently released to meet his God when the time was right. … full text here. 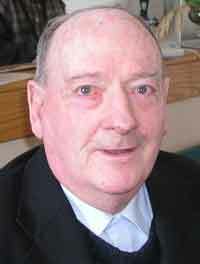 John Ayscough is quoted as saying, “Death is but a sharp corner near the beginning of life’s procession down eternity”. These words seem appropriate in attempting to preach the word at the funeral of Fr Michael McGlinchey. In the last few years Mick’s walking style was considerably slower making sharp corners difficult to negotiate. As was observed of a famous man in his declining years, frail step following frail step – going nowhere with elegance. … full text here.